In the last posts, we discussed the first four of these principles. Today, let’s focus on the fifth principle: Incorporate sufficient protein in your diet. And, as usual without any fluff stuff, let’s get to it. First, what are proteins and what is the big deal? Proteins are the main building blocks of the body. They’re used to make muscles, tendons, organs and skin. Proteins are also used to make enzymes, hormones, neurotransmitters and various tiny molecules that serve important functions. Some of these amino acids can be produced by the body, while we must get others from the diet. The ones we cannot produce and must get from our foods are called the “indispensable” (sometimes also called “essential”) amino acids. There are different opinions on how much protein we actually need. These are clearly amounts below which nutritional deficiency will result. Interestingly, DRI reference manual does not specify any upper limit at which protein might be harmful, although there is quite a bit of discussion about adverse effects of taking too much of a specific amino acid. Most experts agrees that protein needs depends upon a number of factors that include activity level, age, muscle (or lean) mass and current state of health. The range seems to be from 0.5 gram to 1.0 grams per pound of body weight. In case one is overweight, it is recommended to use lean mass weight to calculate the protein need. Most optimal health experts, such as Joe Dillon (The Joe Dillon Difference), Dr. Life (Life Plan), Bill Phillips (Body for Life) whose focus is on building optimal muscle mass, recommend amounts on the higher end of the range. That is, 1.0 or 1.2 grams per pound of body weight per day. The factors often discussed in terms of quality of protein are efficiency of absorption, and how “complete” the protein is, i.e., does it contain all indispensable amino acids. Another important factor I believe is whether eating enough protein will bust your carbs, fats or calories budget. Eating lots of breads may give you sufficient proteins but it will probably bust the carbs and calories budgets. Also, eating lots of rich or fatty meats for sufficient protein will most likely bust your fats budget. But how much of these foods should I eat? 1 cup of soybeans supplies about 20 g of protein. Cereals, grains, nuts, and vegetables contain about 2 g of protein per serving. Since I am interested in continuing to build my lean mass reserves, I decided to budget protein in the upper end of the range, about 1 gram per pound of my body weight. I weigh 161 plus minus 2 pounds these days, so 160 grams of protein per day is my target. I am a vegetarian, I assume I get about 10 to 20 grams from vegetables, legumes and eggs and egg whites. I supplement the remaining using shakes of whey isolates or whey concentrates and isolates mixed. That makes for shakes 4 to 5 times a day: breakfast, lunch, while going home from work, post-exercise and sometime before going to bed. If I ate meat, I will do just one or two shakes a day. Do you feel that this simplifies the confusion about proteins? Post #23 – Eating for Optimal Health Part II – What you eat, how much you eat and when you eat, all matter. Eating for Optimal Health Part II – What you eat, how much you eat and when you eat, all matter. Today, let’s focus on the very first principle: What you eat, how much you eat and when you eat, all matter. And, without any fluff, let’s get to it. For optimal health, what we eat needs to provide all these items in optimal quantities. If any of these are taken in insufficient quantities, suboptimal health will result. How much you eat: One aspect of how much to eat is based on how much energy we need every day. The other aspect is to eat so as to receive optimal quantities for our bodies’ needs a) through g) above. The first aspect about energy, in-turn depends upon two factors. How many Kcals (or Calories) do we need for the basic metabolic activities (beating heart, circulation of blood, breathing, maintaining body temperature etc.). And, for other physical activities which can depend upon our lifestyle, taking elevators vs. taking stairs, number of steps walked in a day, exercise or no exercise, driving to work or biking to work, doing the work manually or letting machines do the work, etc. And, there is yet another factor that dictates how much to eat question, i.e., how efficiently is your body able to convert food to energy. Basic metabolic cycle, called Krebs Cycle or the Citric Acid Cycle involves myriads of elements to convert carbs, protein and water into energy. When to eat: While there are many theories as to when to eat, there is one major principle that is well understood and is critical to optimal health: Sugar Management. Body converts carbohydrates into glucose (sugars) before they can be converted to energy using the Krebs cycle. Rate at which carbs convert to sugars depends on the glycemic index of the specific food. And, how much sugar is generated, also called glycemic load, in this process is based on glycemic index and the quantity of food. Body either uses up all the glucose it generates or it stores away what it cannot use in the form of body fat. For optimal health, one must eat just enough, so that all of it can be converted into stored energy rather than stored fat. This means eating meals more often, if necessary, to not generate excess that will have to be stored away as fat. Bottom line and My Personal Plan: Given all these factors, you can easily imagine why there is much room for controversy about what to eat, how much to eat and when to eat. Yet, third expert may argue that if you are missing just a few key ingredients, your energy cycle may be all messed up and nothing else will matter. In my case, I decided about 2500 calories meet my daily need. 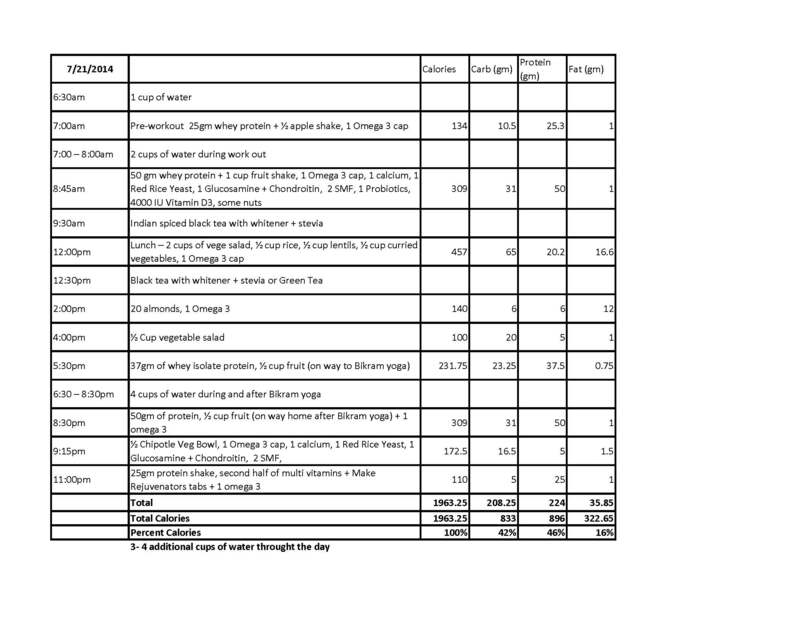 Budget 1 gram per pound of body weight for protein. What remains is budget for carbs. Thus, Calories from carbs = Total Calorie budget – fat cals – protein calories. Divide by 4 for number of grams of carbs. 1060 cals from carbs, i.e., 265 gms. Use fruits and vegetables as the basis for carbs that will not only meet carb requirements but also most of the micro nutrients. It is really easy to blow carbs budget with breads and pasta, and most of those also have very high glycemic load. Use your choice of protein sources for the budgeted amount of protein requirement. Again, be careful in selecting protein sources, since it is very easy to blow the fat budget with poor choice of protein sources. Break up intake into at least six meals and mix proteins with carbs for each meal to keep sugar level throughout out the day and also prevent spikes after each meal. 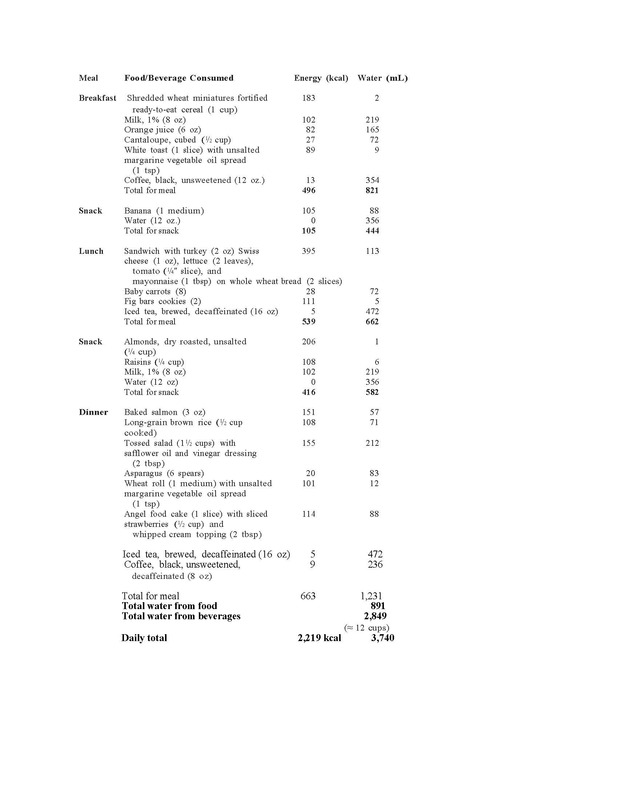 For one day, I did a complete journal of what I ate and also using resources on the Internet figured calories for carbs, proteins and fats. This was a particular intense day during my 21-day Muscle Mania challenge. I don’t always do strength training workout with my trainer and Bikram yoga the same day. Below here is the result. Remember, I am a vegetarian and I have been using Whey Protein as my major source of protein. You can Click on the picture to enlarge it, if it is not readable. Do you feel that this simplifies the mumbo jumbo of what to eat, how much to eat and when to eat for optimal health?